Activities for every interest can be found in Allegany County. Outdoor adventures from rappelling to canoeing to cross country skiing; walking architectural and heritage tours; charming shops where the shopkeepers greet you with a smile; and a calendar full of festivals and events keep people of all ages entertained and coming back for more. 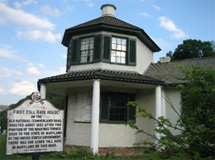 For more information visit the County's Tourism site at www.mdmountainside.com. Our county boasts a history that goes back to pre-Revolutionary times, beautiful architecture, an authentic steam train (www.wmsr.com), the western terminus of C&O Canal (www.canalplace.org), and a plethora of outdoor adventures from mild to wild. 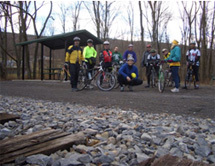 The Great Allegheny Passage, which is now completed, links the Washington DC to Cumberland C&O Canal Trail with a series of hiking and biking trails in Western Maryland that connect into Pennsylvania, creating a continuous trail of 380 miles from Washington to Pittsburgh. You'll find a growing and thriving artists' colony here. Allegany County has become a mecca for artists looking to create surrounded by the beauty and serenity of the mountains (www.alleganyartscouncil.org). Our local theatres provide professional performances of the highest caliber, in Cumberland at the Cumberland Theatre and Embassy Theatre and at Frostburg State University through its Performing Art Center.